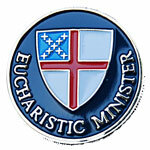 Lay person licensed by the bishop to administer the consecrated elements of the eucharist. Lay eucharistic ministers may be licensed to administer the consecrated bread and wine at any celebration of the eucharist in the absence of a sufficient number of priests and deacons to assist the celebrant. They may also be licensed to go from a Sunday eucharist or other principal celebrations of the eucharist to share the sacrament with members of the congregation who were unable to be present at the celebration because of illness or infirmity. Lay eucharistic ministers may be licensed for either or both ministries. This ministry is understood to be an extraordinary ministry, and is not to take the place of the ministry of priests and deacons concerning the administration of the eucharist. Prior to the current lay ministry canons, specially licensed lay readers administered the chalice at the eucharist and were known as "chalice bearers." Please contact us if you would be willing to be a Lay Eucharistic Minister one Sunday a month. Let us know and we will add you to the calendar below.